You might know that I recently discovered the Eve of St Agnes brand on the Beauty Crowd website. 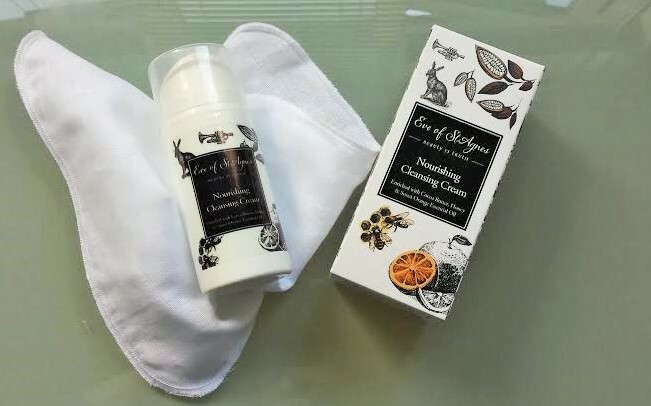 Then when I was talking to the people from Beauty Crowd about the Eve of St Agnes Body Cream they told me I really needed to try the Nourishing Cleansing Cream as it was one of their favourite products. I haven’t quite worked out why it’s not available on their site – maybe they sold out! But it is available from Eve of St Agnes direct here. Anyway, I’m getting a bit ahead of myself! They told me that it was a hot cloth cleanser and I have to say that is one of my favourite ways to clean my face. So I decided to give it a try. The cleansing cream comes in a pump dispenser and comes with a good quality muslin cloth. It smells so good as it goes on as it contains sweet orange essential oil. It gives you a deep down clean feel but moisturises too and isn’t at all drying. It takes off all my make-up. I’ve been using it as a second cleanse after an oil cleanse but it’s perfect to use alone too. It’s detergent, soap and paraben free, is suitable for all skin types and is vegan friendly. It contains some lovely ingredients that make it sound good enough to eat – like cocoa butter, sweet orange oil and honey. It’s currently on offer at a purse friendly £10 here. Perfect! Previous postSome you win, some you lose! I’ve never heard of this product but I do love a cleanser, might give it a go but I’m very attached to my liz earle one. I think that there are plenty of different hot cloth cleansers but it’s difficult to give up something that works isn’t it?